By Xah Lee. Date: 2006-11-21 . Last updated: 2018-12-20 . In textbooks that teach drawing, often they speak of “one-point perspective”, “two-point-perspective”, “vanishing point”. In this page, i explain what they mean, in terms of the math concept of linear projection. Once you understand them, you'll see that these terms are very misleading. These terms obscure the understanding of the simple principle of projection behind them. In illustration, especially technical drawing, you usually want to render the scene as realistic as possible, in the sense that the proportions are correct, perceived angles are true to the object. The basic principle is linear projection. 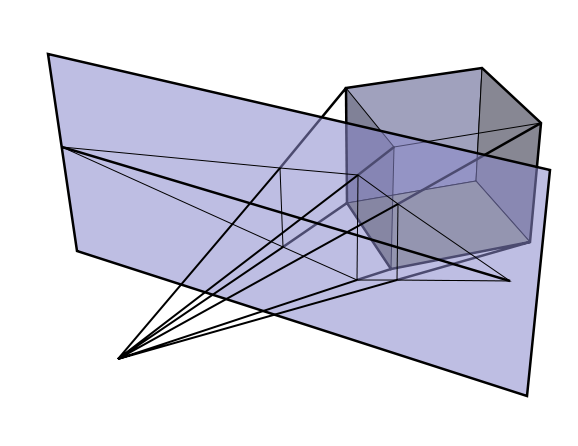 A linear projection is a method of putting points from 3D space to 2D space. That is, point in space to points on a plane. Suppose you have 8 points in space, that are the 8 corners of a cube. Call these given points your Scene. And, you are given a plane (2D), positioned somewhere in this 3D space. Call this plane the Canvas. And, you are given another point, somewhere in the 3D space (but not on the Canvas). Call this point the Camera (or Eye). Then, to project the Scene onto the Canvas thru the camera, here's what you do: imagine a line passing from Camera to a cube corner A. The line will intersect the canvas. That point of intersection, label it A', is called the projected point of A. Similarly, you do this for all other points in the Scene. You'll end up with a bunch of points on the Canvas. This process is called linear projection. So, now, the 8 given points in space (the Scene) will have corresponding 8 points on the plane (the Canvas). Now, suppose your cube's corners are connected by lines. Imagine that lines are just made up of many many points on the line. So, you use the same method to project each point onto the canvas. Basically, lines in the Scene will become lines on the Canvas. Another interesting theory you might want to know is that, any circle in the Scene will become a Ellipse or circle on the Canvas. Perspective Drawing means a drawing with correct perspective, which means, drawing based on the principle of linear projection. 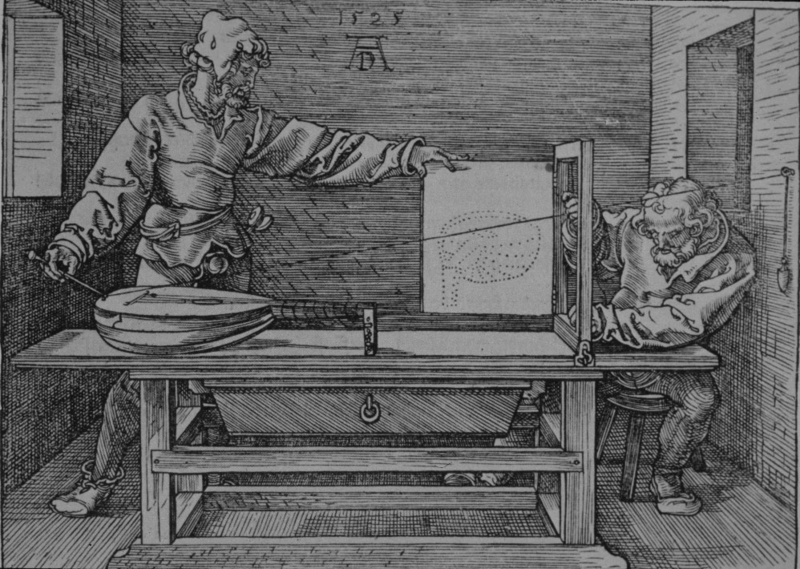 “Man Drawing a Lute”, by Albrecht Dürer (1471 to 1528). This drawing shows a simple but impractical way to correctly do a perfect drawing. The object to draw is the lute. The camera position is the nail on the wall. The paper (shown as a pivoted frame) is the plane the projection is to be onto. Almost all drawings since ~1300, are perspective drawings, for example, in Batman comics, or in Japanese anime comics, or in illustrations. The term “perspective drawing” is in contrast to flat drawing. For example, line drawings you see from 5 years-old kids, or religious drawings in Dark Ages. Some artwork are flat drawings. For example, see: Art of Diego Rivera • Art of Frida Kahlo. Suppose you want to project lines and points from 3D space onto a plane. Let's call the lines and points Scene and the plane the Canvas. Theorem: In the scene, if line A and line B are parallel, and they are not parallel to the Canvas. Then, the projected image A' and B' on canvas will intersect. Their intersection is called the Vanishing Point. Consequence: In a perspective drawing, there may be many vanishing points. Any 2 intersecting lines on canvas may mean that the 2 lines are parallel in the scene. However, concurrent (aka intersecting) lines on the canvas do not necessarily mean the corresponding lines in the scene are parallel. The standard term of “A one-point perspective drawing” among art schools, just means that the drawing has just one set of lines that are concurrent. The logical implication is that the scene only has just one set of parallel lines. In reality, scenes in real life are likely to contain more than one set of parallel lines, if it contains parallel lines at all. (For example, buildings, tables, or other man-made objects.) However, when making a drawing, a single set of parallel lines is chosen for the drawing's perspective basis. Similarly, “two-point perspective drawing” is just a drawing that has 2 sets of parallel lines in the scene. The “three-point perspective drawing” is a drawing that has 3 sets of parallel lines. Commonly, in a drawing, the scene often contains a building, or a table, bed, house. Almost always these objects are a just rectangular brick (cuboid). Since a cube has 3 sets of parallel lines, corresponding to 3 of its sides from a corner (think of it as x, y, z axes), thus it has 3 vanishing points when projected to the canvas (i.e. each set of parallel lines on the cube will have a intersection on the canvas). Thus, to draw a cube, there will be 3 vanishing points. Since cube are so common, so a drawer basically fix 3 points on their canvas, and draw rays shooting out from these points, which forms the reference frame of a cube in the scene. This is why the “three-point perspective drawing” is popular. When we do linear projection from a scene to a canvas, we generate points and lines on the canvas, and the process is rather abstract, impossible to do in real life except using modern invention of camera. For a illustrator, she has to find a practical way to “project” the scene to her canvas. In a scene, a reverse operation, by first defining 3 points as the vanishing points on her canvas, and use those to infer where parallel lines are in the scene. Perspectives consisting of many parallel lines are observed most often when drawing architecture (architecture frequently uses lines parallel to the x, y, and z axes). Because it is rare to have a scene consisting solely of lines parallel to the three Cartesian axes (x, y, and z), it is rare to see perspectives in practice with only one, two, or three vanishing points; Even a simple house frequently has a peaked roof which results in a minimum of five sets of parallel lines, in turn corresponding to up to five vanishing points. In contrast, natural scenes often do not have any sets of parallel lines. Such a perspective would thus have no vanishing points. The terms “one-point perspective drawing”, “two-point perspective drawing”, and “tree-point perspective drawing” are rather very misleading terms. By their names, they seem to indicate that there are different types of perspectives. In fact, as far as the math goes, they are just all linear projection. Francesca was also the first to accurately draw the Platonic solids as they would appear in perspective. Perspective remained, for a while, the domain of Florence. Jan van Eyck, among others, was unable to create a consistent structure for the converging lines in paintings, as in London's The Arnolfini Portrait, because he was unaware of the theoretical breakthrough just then occurring in Italy. Note that, besides linear projection, there are many other types. Another common type that is very useful to realistically show 3D objects on 2D paper, is called Parallel projection. Remember that when we do linear projection, we are given a point outside the plane called the Camera. Suppose we are given 2 points A and B in the scene, a canvas in front of these 2 points, and the Camera E in front of the canvas. Now, imagine the line AE and BE. Now suppose we move the point E. As E moves further away from the canvas, the lines AE and BE will become more and more parallel. A parallel projection is the ideal that the eye is infinitely far, such that all these projection lines are actually parallel. There are quite a lot other types of projections, such as spherical projection (aka stereographic projection), conical projection, cylindrical projection, … etc. These are useful for making maps and other applications than drawing. See Graphical projection.